Long Beach Heating and Air Conditioning is proud to be Long Beach's exclusive Bryant® Factory Authorized Dealer. Bryant provides our residential and light commercial clients with the best value in heaters. Their furnaces, heat pumps, mini-splits, and packaged systems all meet rigid quality standards, feature the latest HVAC innovations, and are made to last. They're also backed by excellent warranties and come in a broad range of models to accommodate nearly any budget. All of our furnace installations are performed by experienced, factory-trained technicians who are NATE certified to perform gas heating installations according to the industry's best practices. Six Decades of Experience. 1,000s of Satisfied Clients. NATE Certified HVAC Technicians. At Long Beach Heating and Air Conditioning, we've provided furnace sales, installation, and replacement services throughout Long Beach, Los Alamitos, Signal Hill, Seal Beach, Huntington Beach, Palos Verdes, Torrance, Manhattan Beach, Paramount, Downey, and surrounding communities for the last 59 years. We have over 90,000 satisfied residential and light commercial clients and an excellent reputation for providing great service at a fair price. Over the years, we've installed thousands of central heating systems, including gas furnaces, heat pumps, and packaged systems over the decades and always perform all work to code. Long Beach Heating & Air Conditioning has been a Bryant® Heating & Cooling Systems Factory Authorized Dealer since 1988. As a Bryant Factory Authorized Dealer, we're required to have NATE certified HVAC technicians, participate in ongoing factory training, and prioritize customer satisfaction. By going above and beyond to ensure that our clients have a positive experience every time they work with a member of our team and by following the industry's leading practices for HVAC service and installation, we've consistently maintained our status as a Bryant Factory Authorized Dealer, and earned a coveted spot among its Circle of Champions, a recognition that Bryant only awards to the top 55 dealers in the country each year. We've won this distinction two years in a row. Achieve Optimal Indoor Comfort at a Price You Can Afford with Bryant Heating Systems. When Bryant designs their gas furnaces, they focus on performance, energy efficiency, and durability. As a result, even their entry-level Legacy™ models run quietly, are extremely reliable, and have high AFUE ratings of 80 to 95%. Most of their furnaces are ENERGY STAR qualified and backed by industry-leading warranties. With a variety of models across their three primary product lines, the Legacy, Preferred™, and Evolution©, Bryant usually has a heating solution for every type of property and budget. Call today for a free comprehensive assessment to help you find the best heating system for your needs and budget. We'll walk through your home or business, learn about your heating preferences and typical usage, determine what size system you'll need, review your options with you, and discuss how to layout your system for the best results. During this consultation, we'll also review payment and financing options and make you aware of any rebate programs. Once we've answered all your questions, we'll work up a written estimate and email it to you. Because we are invested in the long-term happiness of each of our clients, we stay focused on matching each client to the right solution for their unique needs without ever trying to push anything that they don't need. As a result, we have a stellar reputation among the local Long Beach community for being professional, knowledgeable, and trustworthy. When it comes to new and replacement furnace installations, our workmanship is unparalleled but our prices are fair and competitive. Because we're a participating HERO Program contractor and Bryant offers a financing program through Synchrony Bank, we can also help you finance your new heater or air conditioner. Alternatively, Bryant also offers a "rent to own" program for those who don't qualify for financing. Finally, we will make you aware of any local, federal, or manufacturer rebates that can save you money on an energy efficient system. Long Beach Heating and Air Conditioning is fully licensed and insured. We're also locally owned and family owned. Our team typically serves residential and light commercial clients within a 30 miles radius of Long Beach, which includes Signal Hill, Huntington Beach, Seal Beach, Los Alamitos, Palos Verdes, Redondo Beach, Hermosa Beach, Torrance, Paramount, Hawthorne, Manhattan Beach, Downey, and beyond. We can usually accommodate next-day appointments for furnace sales and installation estimates. Staff is quite knowlegeable and professional. They are always prompt in responding and they notify you well in advance if they are unable to meet the agreed upon schedule. 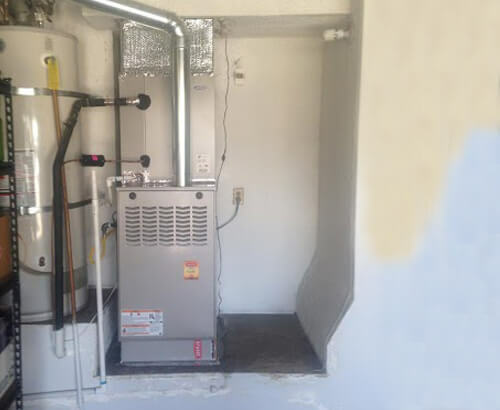 Long Beach Heating and Air Conditioning installed this new furnace in Huntington Beach, CA. 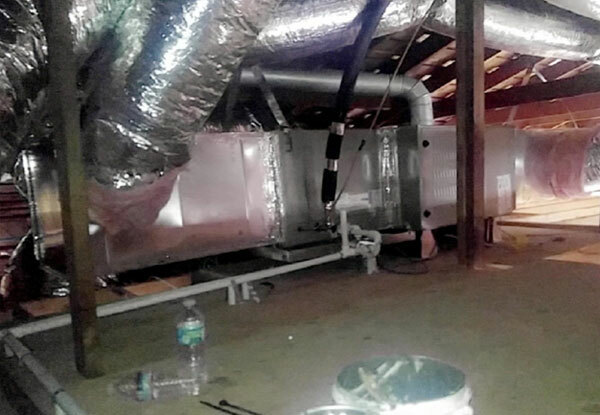 This residential furnace installation included all new ductwork and an evaporator coil for improved energy efficiency. Our team of HVAC experts has the ability to work on heating and cooling units anywhere in your home, including in the attic, on the roof, or outdoors.